Semi-pet cat: Young black and white boy. Kin of Kenji. Suspected abandoned pet. First appeared Sep/Oct 06. Snowball resemblance. Hangd out at Sally’s as of late 07. Betsy has been sterilised on Thursday, 9 Oct. The four foetuses she was carrying have been aborted in the process. We sent on the little ones with well-wishes and sadness. Betsy, as she is so friendly, will be prepped for adoption. As has been mentioned, she was an Area2 kitty. We had mentioned the frustrating situation with the kitties in Area2. Of the kitties mentioned, we have been sighting Bambi randomly ever since. mostly around the area’s eatery. But we’ve not managed to establish her schedule and have not managed to “get” her. She is now nursing a litter of kittens, as elusive and skittish as ever. In fact, the night we got Betsy, we were trying to find her, as she is super emaciated, probably due to the strain of nursing her babies. The good news is we think we may be getting nearer to a Bambi schedule – for the past week, btmao has managed to find and feed her 3 out of 7 times. The headache though is that we need to wait for her babies to be weaned, and we’re nervous as btmao found Stanley on the night we catnapped Betsy. Also, Bambi needs fattening up before de-mojoing. With an irregular schedule, that’s going to be a challenge. 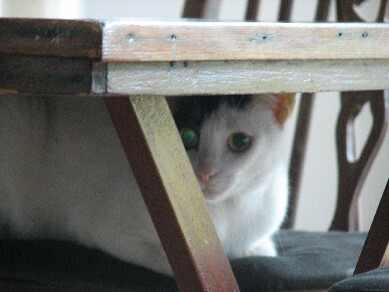 The shy little white kitten with tabby patches has been sighted only once since, early this month. Also as skittish as ever. 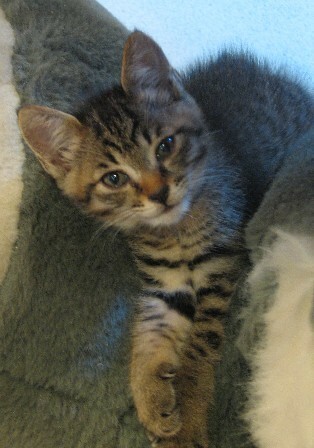 However, it seemed to be healthy, and is now a bigger kitten. 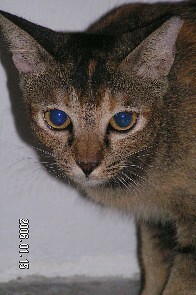 Sarsi, the last cat we saw has never been sighted since. That doesn’t mean things are quiet in Area2. Even before Freda’s discovery in February, we know there are many elusive new kitties around there, due to irresponsible pet owners. We’ve had random distant sightings of a ginger cat, alone and chasing after another one whom we only heard. Between then and now, we’ve had one-off sightings of different cats. 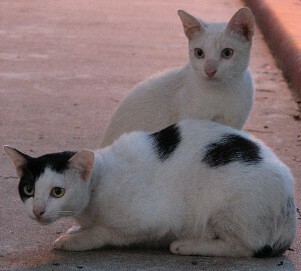 The most recent one is a 3-5 mth scaredy, mostly white calico kitten first sighted on 26 Sep 2008 sitting in the drains. It is likely a girl. btmao sighted her a week later, hanging out near Bambi’s eatery territory. Saba, as far as we can see is still intact, with the very virile and wanderful Stanley paying court to free-ranging pet cat just yesterday. We have decided to not offer any more help to the family due to 2 reasons: 1) the family shows no concern about the issue nor have them attempted to contact us about arrangements for Saba even though we see Sue, the woman of the house often enough on the way home from work; 2) since our last update on Saba, Sue had only called me once, but was more interested in trying to get the same “deal” for her friends than to make arrangements for Saba even though I had already told her sterilising Scottie, Sunny and Sumie was a one-off deal that we were paying out of our own pocket due to the circumstances. Scottie was out and about, and as friendly as ever. We also caught a glimpse of Sunny. Though Sumie was not sighted, we believe she is well and about, as we’ve sighted her previously. All three look fantastic, and of course it is being mojo-less that gives them their sleekness. Benji is still around, and seems to have moved back to his original territory, rather than stay around Saba’s area. But even he seems to have gotten in on the act, and is only randomly sighted. He was most recently sighted and fed on Thursday evening. All in all, our report card on Area 2 this year has been quite dismal. Things have just not been going well in TNRM terms. But with Betsy catnapped, and Bambi finally letting us get a clue about her schedule, maybe the situation can be remedied soon. Hopefuly, we will not have to make difficult decisions as we did on Betsy’s behalf. Though Becky stood us up, we did have a pleasant surprise in meeting Benji.Alothough wev’e not fed him for quite a few months (his schedule having changed without notifying us), he’s actually grown abit and is more padded. He is a lot more affectionate and his coat is very clean too, so it’s evidence that he’s a free-ranging pet cat. However, he was ravenous too, and was exciting impeding btmao’s work as she tried to lay dinner out for him. He was too active for our loan camera, but here’s a shot of him post-dinner. So! I have been busy these two mornings, running around like a good TNRM minion should, taknig care of “business” in area 2. The result? Scottie and the siblings, Sumie and Sunny have lost their mojo yesterday. 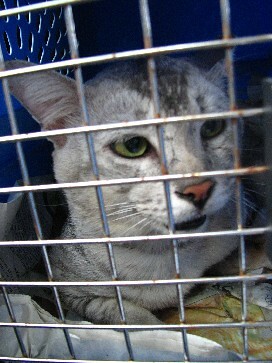 Scottie, a lovely silver agouti tabby, on the way back from the vet today. He’s still wondering what hit him. Soon after this vid was taken, he relaxed and napped all the way back. In contrast, the siblings were as calm as ever. Sally appeared in area 2 with a tipped ear. She displayed the nervousness of a cat thrown into a new environment. Gradually she established herself in one of the two carparks there. By 2006, she became a semipet of Sue’s family, who refused to listen to advice to not leave food and water outside their ground-floor flat. With a regular food supply, Sally wasn’t too keen to depend on the tec soup-kitchen. Sue’s flat is very near the carpark which Sally used to call home. Complaint in Sally’s area led to the discovery of Stanley, a long-tailed silver tabby adult male, and a very handsome young dilute calico male (never sighted again). Spotted Scottie for the first time in the opposite end of area 2, away from Sally’s. He proved elusive. Later, we found out from Sue that he also frequented Sally’s for the food Sue leaves outside. Sometime before this, a different female cat who has established herself in the same area and went to Sue’s for food, gave birth. She was Sumie and Sunny’s mother, a cat we’ve never sighted. She was caring for and moving her litter of 3/4 kittens around. She was later killed by a dog. Sue adopted the litter, then less than 2 months old. In addition to Sumie and Sunny, there was another ginger kitten with a long tail, who has since disappeared. 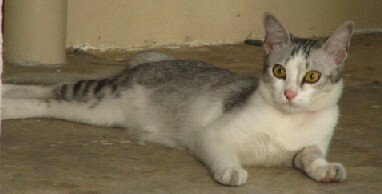 Saba gives birth to a litter of 5 during Ramadan/near Hari Raya, of which only 1, Sabia, is still living. Somewhere in between all the changes, Sally decided to move back into the carpark. We sighted Sumie and Sunny for the first time and flyered all the ground floor units. A week after the flyering, Sue spotted btmao feeding Sally at the carpark, and approached her. That’s how the whole story started falling into place. btmao talked to Sue and got her to agree to sterilise her cats – Sumie, Sunny, Saba and Sabia. Benji, who’s been missing for months, also appeared! But he was promptly chased off by Scottie. To cut a long story short, Sue said yes after some negotiating and excuses. Sue has 4 children, is a housewife and claims her husband, who works shift, is the decision maker. We even got CWS involved in case they were in financial difficulties. But Sue said they will arrange for sterilisation themselves and the husband, who drives, will send Sumie and Saba for sterilisation first, in the weekend past though we tried our darnest to persuade her to send Sunny as well. But getting any cat done is better than none. We were relieved and were cautiously happy that at last we’ve met a free-ranging pet cat family who just might make honest pets out of their cats. But by this Monday, the two were still intact – Sue claimed her husband wasn’t free to send the cats. Now, if you’ve ever arranged for a sterilisation appointment, you’d notice a few things that doesn’t jive. Anyway, btmao was especially anxious as the siblings were looking to be at least 7-8 months old, and Sue had said that Saba was mated by Stanley in the week past. That evening, when btmao saw Sumie, Saba (who’ve both been kept indoors to prevent “accidents”), Sunny and even Scottie on the scene, she decided we should just rob the siblings, Saba and Scottie of their mojo and deal with the after-effect. Of course the fact that we have to bear the sterilisation cost for 3 pet cats left a bad after-taste in my mouth. But I was practical and I agreed with btmao’s decision. Luckily, we were able to book 4 sterilisation slots for the next day with Foster Mum’s help. In between all the logistics, btmao got in touch with Sue and told her our plans. Sue was amendable since it meant she didn’t have to pay a cent. In addition, she agreed to house Scottie for us. I arrived with the carrier for Scottie, and proceeded to impress on Sue that I am jobless and we’re doing this for the sake of every cat outside, and not only to help her cats. We decided not to send Saba in yet after checking in on little Sabia. Today, I collected the de-mojoed kitties. The vet receptionist remarked that all three were absolutely lovable and easy to handle. I told her they’re probably home pets allowed to free-range but no one wants to take responsibility. She laughed. Upon arrival, I released Scottie, who proceeded to cry for a bit and then ate out of the bowls outside Sue’s flat. Then he spotted Benji and decided to get some exercise, and chased off Benji. I hope he’ll mellow out and learn to tolerate poor Benji, who is beginning to try to get into Sue’s flat (according to Sue, he’s super-affectionate, a trait which we are well-aware of). At the siblings’ home, I spoke to Sue about preparing for Saba’s turn, which should be soon, especially since Sabia was already starting on solids, as she claimed. I emphasized that the siblings’ bill will be ours but that for Saba and Sabia’s bills she will have bear the full amount. I also showed her the taxi receipts to impress on her the cost of transport and asked her to factor that in to the sterilisation costs as well. (Surprisingly, Sue did not return the receipts to me… instead she gave me $30 as reimbursement. I told her we’ll use it for Stanley). Present at her home was her sister, Julia. Julia lived in a nearby block and she revealed a piece of news that was good for us – Stanley, who refuses to let us near, trusts her and she’s able to catch him. So I asked her to assist – if we can get Stanley at the same time as Saba’s appointment, we’ll share the transport costs. Also, Julia said that Stanley hangs out at a different part of Area2… Sasha’s place, and where Benji and Kenji used to be too. That was also near to where we first spotted Scottie. btmao and I suspect that Sasha and Benji and Kenji had been displaced by Scottie and Stanley or simpyl changed their routines. Neither Sue or Julia have ever seen Sasha or Kenji, whom we’ve not sighted for a few months. But if Benji is able to survive, they may be coping too. Hopefully, after we get Stanley, both he and Scottie will mellow out enough to allow Sasha and Kenji to return. we’re trying to save their cats’ lives, that Town Council is not happy and there’s a chronic complainant lurking around. All true. we do not want her to tell people about what we’ve done for her as the risk was getting too huge for the cats in her area, and we do not have the money to sterilise every pet cat, which should be done by each individual owner anyway. Regardless of the fact that I still feel we’ve been led by the noses in sterilising the siblings, ultimately, we will still try to work with Sue – it does take more energy to be antagonistic. Besides, we’ve had a few minor pleasant surprises out of this whole saga, which balances out the frustrating parts. Saba, who is Smoky Lost, simply Lost to Sue. Estimated 8 months old – was pregnant at 6. Sumie, who is Angel to Sue. Her surgical site was only a tiny dot… really amazing work. Sunny, who is Fluffy to Sue. He peed in the litterbox they prepared and proceeded to beg for food. Upon arrival, the first thing Scottie tried to do was enter Sue’s flat. With him is one of her 3 daughters. Poor Benji, creeping back to the scene, and hiding on a chair after being violently chased off by Scottie. Let’s hope things will get better for him. Posted on May 4, 2007 by calsifer | Comments Off on Kenji’s back! Last night, V returned the newly tipped-ear Kenji. He looked good, none the worse for wear and despite the stress of being abducted and away from his home territory since Sunday morning. We brought him back to where we nabbed him. Then i prepped for a vid and open the carrier door. He simply stared doe-eyed. I got a bit worried but suddenly he launched himself out of the carrier and disappeared into the night. Luckily, I gave him a bit of leeway and was using the zoom function to vid him. No food for him then, we had wanted to feed him as V said that he had eaten only a tiny bit earlier. Anyway, as we were leaving the release spot, who should we see but Benji mosseying along from another direction. We hope the brothers reunite soon. btmao’s seen them cuddling together under the bushes so obviously they’re very close to each other. Check back for the Kenji-rocket launch vid. Comments Off on Kenji’s back! Yesterday we rushed Chrissy to the vet, caught up with the cats at Foster Mum’s and today, we managed to bag Kenji for his mojo-cision, while spotting a new 4mth old tuxedo boy in the same locale and spooking Benji off. Amid all the action, btmao got help from a young girl and we talked to her at length about TNRM and responsible pet ownership, we hoped she’d evangelise what we pumped into her at her school, at home, and among her friends. The trouble with the new vet and new pet transport (whom we tried for the first time, and were evaluating in case our regular go-to pet transport-sterilisation-arrangements guy, V, couldn’t help out for future cases) who collectively botched Lizzy’s checkup must also be documented. They’re both warily watching a large pet dog on a walk going by behind me. At least they are somewhat savvy. VID – White Shadow: See how Kenji follows Benji’s lead. He takes every cue from him. VID – Cautious but wanting attention: They both will approach and come very near when you’re quiet and still. They have looks of cats seeking affection but any move from me still sends them scrambling. NOTE: Remember how easily spooked and untouchable Kenji was? Even on April 1. Sunday, he would’nt allow btmao to touch him. But the very next night, btmao could touch and even scruffed him experimentally, in preparation for mojo-robbing. He did not react at all. But he jumped the next evening’s appointment, which we had planned to send him for his mojo-snip. Not only Kenij, even Benji and Sasha didn’t turn up! Good news: Kenji is cottoning on to the fact that btmao is the resident cat-mum in these woods. Earlier this evening, he’s allowed first contact when having dinner, with Benji of course. We’re hopeful, very hopeful, that we can rob his mojo soon. Sasha was there for dinner too, but of course she still can’t stand having the boys around, and uses her own exclusive suite. After we cleaned up after the satiated ones, we were making our way back to Area 1, when lo and behold! btmao’s 6/6 eyesight focused on a fluffy lump under a sapling. 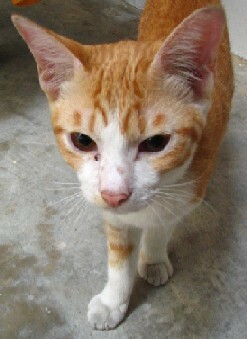 It was a young cat that she had first sighted 2 sundays ago and lost sight of in the Area 2 carpark. It was newly abandoned we think and was too spooked to respond to friendship. We had not seen it since. But this time, there it was, in plain sight, for the perfect-sighted,and behaving like it’s been there for ever. We milled around abit with it. It was a she, a bit too skinny – you can use her spine for a xylophone. But friendly. Even away from good lighting, it was obvious she had a tearing right eye. Other than that, she looked ok. She looked like a miniature Remy, only she still has her eyes intact – which is a huge relief. But she’s not all that tiny, probably is a yearling. She has a very soft voice like him too. btmao and I looked at each other. We sighed/groaned, and guess who we gonna call? Foster Mum of course. We made arrangements for the kitt to move in after a vet visit for checkup, jabs and deworm tomorrow. 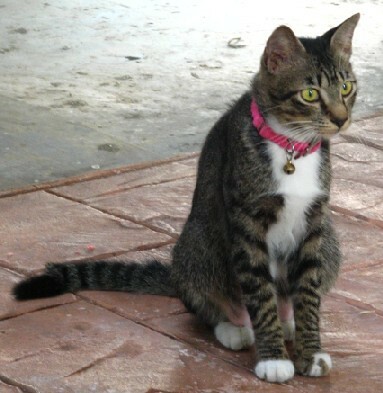 Then I picked her up and we moved her to a void-deck, for feeding and a better look. She purred all the way, and only struggled a little. btmao opened a fussie cat can – all the goodness of tuna with salmon and she lapped it all up in 2 blinks. The girl was ravenous! btmao left to retrieve a carrier from home and I watched/kept her around. She kept nosing the cleaned paper ‘plate’ and sniffing the can for more. Obviously she’s not had much food for quite a bit. But we did not allow her anymore than the 80g she gulped down to minimise the possibility of diarrhea. She was a bit bewildered too, and was torn between moving off and sticking around for more. So I did the only thing I could while waiting for the cavalry, As I provided chin-tickles and head rubs, she eventually relaxed and lied down for everything I gave her, her purr is amazing. I looked her over and she seemed parasite-free. Maybe it’s because both are fluffy and tabby-furred, but from certain angles, she looked like Kheilly too. And yes, I felt pangs when it hit. Anyway, she seemed a perfect and healthy cat, and I can’t help wondering why she’s been dumped. Was it her less-than-perfect form? She either had a body too long for her limbs or limbs too short for her body length. She also has a gait like Orli’s – splayed and a bit uneven in the hindlegs, which seem too long for her frontlegs. Was she dumped for cosmetic reasons? Then I noticed her inner right front paw was very wet and matted. Maybe her right eye was an issue (coincidentally, Remy’s blind eye is also the right one). But she can see out of it fine, and it looked clear. btmao returned with the carrier then. It was a simple thing to get the kitty in. She freaked out for a bit, but only called softy a few times and settled down. On the way home, where we’re going to house her for the night, I suggested naming her April, for obvious reasons. btmao agreed. We’re probably to lose sleep tonight – she will be isolated in a room, and the slackers of course will stake it out, and then of course there’s going to be commotion all night. Oh well, we’ll take it one growl at a time. Our mum looked in on her too – and surprisingly, we felt a bit miffy that she’s already longer than Rheilly. Last weekend, when Neo found her furrever home, we were relieved to have our cattery headcount down to 3 – Corrie the permanent boarder, Chrissy the liver-failure old girl, and Frankie the supposedly looking-for-a-home cat turned freeloader. (Angel and Cassie have their respective sponsors). Now we’ve got April girl, new kitnapped kitt and our headcount’s gone right back up: i can only thank my portentous big-mouthed self-rib here (and Mama Piggy for cementing the jigamarole with the furrever incantation).